The JV and varsity girls are on the road this evening to play Campbell in an area game. The varsity girls are going into tonight’s game with 1 win, and 0 losses to Campbell’s 1 win and 2 losses in area standings. The junior varsity and varsity boys teams take on Decatur at home tonight in non regional play. On Saturday, March 24th both the junior varsity girls and boys teams will take on Northgate and Newnan in the 2018 Coweta Cup JV Tournament. This year’s tournament is being hosted by Northgate High School. The JV Girls play at 9:00 and 10:00. The JV Boys play at 1:30 and 3:00. Go Indians! Earlier this week, Mother Nature forced the Varsity Lady Indians to reschedule their March 19th, regional game against Wheeler to Wednesday, April 11th at 5:30. Looking back at last week, the varsity and JV girls started the week out with wins. Monday, March 12th, in a non regional home game, the varsity girls upended North Cobb 18 to 6. The junior varsity girls added another victory to their season when they defeated Pebblebrook 13 to 1. Carrollton took a cue from the Monday night’s cold temperatures to put both the junior varsity and varsity boys on ice in what seemed to be a grudge match from EC’s preseason win over Carrollton. In the non regional game, EC’s varsity boys fell to Carrollton 5 to 8; the JV, 4 to 7. On Wednesday, the varsity boys faced off against North Atlanta at home in their third regional game of the season. Madison Duffessy lead the team in defeating North Atlanta 13 to 11 with 4 goals, 2 assists, and 7 ground balls. The remaining 9 of the 13 goals were scored by Bailey Brogan with 3 goals, 1 ground ball; Jackson Elliott with 3 goals and an assist; Christian Barnes, with 2 goals, 1 assist, and 5 ground balls; and Nick Daliet with 1 goal and a ground ball. Other notable mentions of the night were Goalie, Devin McCarragher, with 10 saves; Tanner Schmieder, Owen DeBole, Gareth Ronfeldt, Chase Swilley, and Wesley Chambless each scooping up a ground ball, and Kalope Wingo with an assist and 3 ground balls. Earlier Wednesday evening, the varsity girls defeated Luella 26 to 2 in a non regional game. Friday, all four teams were on the road. The JV girls fell to Northgate 5 to 11. In a non regional game, the varsity girls were defeated by the Lady Vikings 17 to 6. Adelyn Ryan led the scoring for the Lady Indians with 2 goals, followed by Caitlyn Moore and Anna Robbins both with a goal and an assist, and Katie Morgenroth and Kendall Buttry each scoring a goal. Meanwhile, at Whitewater, the JV and varsity boys’ teams were taming the Wildcats. Christopher “Squish” Easly and Brookins Vaughn lead the way with each scoring 2 goals, along with goalie, Hunter Beckworth’s 8 saves to defeat Whitewater 4 to 2. Midfielders Jackson Millians and Logan Woodward both had an assist and goalie, Nate Thomas had a save. The varsity boys rolled over Whitewater in a non regional game. The varsity defense held Whitewater to 5 goals allowing the offense, to drive EC to an 11 to 5 win over the Wildcats. Senior Madison Duffessy was the lead scorer of the the team with 7 goals, an assist, and 3 ground balls. Bailey Brogan assisted with the scoring with 2 goals, 1 assist and a ground ball, along with Christian Barnes and Kalope Wingo , each scoring a goal. Seniors, Nick Daliet, and David Neary each had 2 assists. Neary, Jackson Elliott, Ryan Mitchell, Chase Swilley, Gareth Ronfeldt, Tanner Schmieder, and Tucker MacDonald each fielded a ground ball. Goalie, Devin McCarragher had 8 saves and a ground ball. The varsity girls lost Wednesday’s non conference home game against Union Grove, 9 to 11. Anna Robbins led the scoring with 3 goals, followed by Kaitlyn Alford with 2 goals, and Adelyn Ryan, Katie Morgenroth, Caitlyn Moore and Summer Watson each had one goal. Goalie Katie Owens had several great saves and Rebecca Ghyzel and Lauren Chavez were strong on defense. On Friday night the varsity boys shut out Pebblebrook in a regional home game. This was was the Indians first win in the 6A-7A/Area2, 2018 regional play. Friday night’s scoring was led by Madison Duffessy with 4 goals, Bailey Brogan and Owen DeBole with 3 goals each, Christian Barnes with 2 goals, and David Neary, Thomas McElwaney, Kalope Wingo, Gareth Ronfeldt and Jackson Millians with one goal each. Many EC parents were impressed with the heart, team spirit and comraderie of the Pebblebrook players. Both the JV and varsity girls teams were on the road Friday night to take on the Whitewater Wildcats. In their first win since 2016, the JV Girls defeated Whitewater 11 to 6. Kenedi Wisenbaker was top scorer with 4 goals followed by Leah Chambers with 3, Sarah Whitehead with 2, and Braylee Marston and Paige Muniz each scoring a goal. The varsity girls fell to Whitewater in Friday night’s non conference away game. Goalie Katie Owens had 8 saves while Caitlyn Moore scored two goals and Adelyn Ryan, Anna Robbins, and Rebecca Ghyzel each scored a goal. The final score of the game was Whitewater 9 – East Coweta 5. Saturday afternoon the varsity boys fell to undefeated North Gwinnett in a non conference home game. At the end of the first quarter, North Gwinnett led EC 4 to 2. Going into the half EC was trailing North Gwinnett, by 5. In the third quarter play North Gwinnett added 6 goals to EC’s 1. Goalie Devin McCarragher and his defensive line held North Gwinnett to 2 goals in the 4th quarter with EC scoring 1 goal. McCarragher had a total of 18 saves during the game. Senior Madison Duffessy scored 5 of EC’s 8 goals. Junior Christian Barns added a goal to the second and third quarter with Bailey Brogan adding a goal in the 4th quarter. The final was EC 8 – North Gwinnett 19. In related news, Chris Golterman of Coweta Score did a write up in Sunday’s Newnan Times Herald of this past week’s games. Shutouts are rare in high school lacrosse, so even if it wasn’t tested much, East Coweta was happy to earn one in a 17-0 victory over Pebblebrook on Friday prior to facing North Gwinnett on Saturday, again at Garland Shoemake Stadium. The win over Pebblebrook allowed the Indians to even its Area 2-6A/7A record at 1-1 while coming off a tough 8-7 overtime loss last week at Wheeler after taking a 6-4 lead into the fourth quarter. 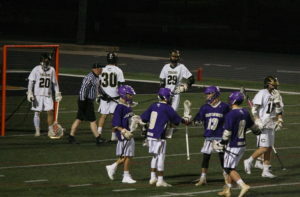 But on Friday, whether it was Devin McCarragher or junior Hunter Beckworth in net, East Coweta’s defense had a less stressful outing against a Falcons team still in the infancy stage of their lacrosse program. In its 10th varsity season, East Coweta scored at will led by senior Madison Duffessy’s four goals and one assists, with the scoring tally coming at a steady pace of nearly one for every minute of the opening quarter. Less than six minutes into the game, the Indians already had a comfortable 5-0 lead, with Duffessy netting a hat trick by the end of the opening period including one in a man-up situation. Senior Bailey Brogan and junior Owen DeBole each added three goals and one assist. Seven East Coweta goal scorers also included a pair from junior Christian Barnes and one each from Thomas McElwaney, David Neary and defenseman Gareth Ronfeldt. Senior Nick Daliet had at least four assists, three of which came in the first quarter. Also on Friday, the Lady Indians fell at Whitewater 9-5, despite a pair of goals from Caitlyn Moore. Adelyn Ryan, Rebecca Ghyzel and Anna Robbins also scored, while Katie Owens made eight saves in net. Katie Morganroth, Summer Watson, Maura Ray and Ghyzel led the defensive effort. East Coweta’s JV girls, however, won its first game of the season by defeating Whitewater 11-6. Local teams from Newnan, Northgate and East Coweta high schools begin state playoff lacrosse action today, starting with the Newnan girls and the EC and Newnan boys.The Indians of East Coweta – the 2017 Coweta Cup champions – are set to host the Walton Raiders today at 6:30 p.m. at Garland Shoemake Memorial Stadium. It’s the first time since 2014 that the Indians (10-4 overall) have qualified for the state lacrosse playoffs, and it’s the first time in more than five years since the EC boys have hosted a state playoff game. EC’s last two playoff games (2013, 2014) were on the road.Click here to read more.